‘The Big Conversation Workshop’ – the pilot. ‘The Big Conversation Workshop’ enables attendees to run a ‘Big Conversation’ in their organisations using the Rich picture process. This process creates conversations that can drive change and communicate effectively. 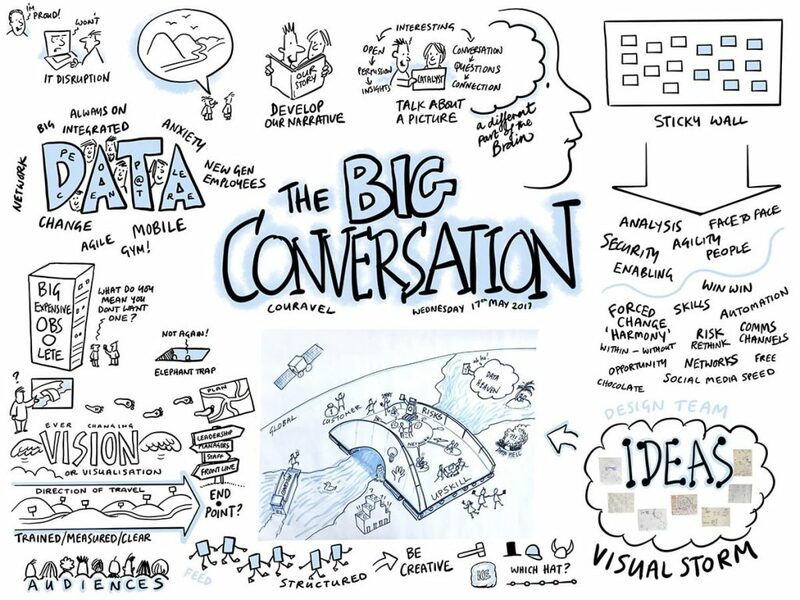 ‘The Big Conversation’ has been developed by Mike Pounsford of Couravel and I provided graphic facilitation and visuals for the workshops. The pilot workshop was held on Wednesday 17th May at Jerwood Space, Union Street, London SE1. The space was excellent, a corner room with big windows and lots of natural light, a good lunch and very helpful staff – a highly recommended resource. The day was facilitated by Mike and myself. I drew cartoon notes of the day and developed a Rich picture sketch. Attendees came from DEFRA, BAE, Accenture, Oxfam, Brilliant Folk and ABRSM as well as Magnetic Business Development . How will developments in technology affect your business in the next 5 – 10 years? The subject for the workshop was “How will developments in technology affect your business in the next 5 – 10 years?” It was fascinating day and not just because Mike and I had worked for some months creating and planning the workshop. The group, from quite different organisations and backgrounds, worked well together. They were engaged and articulate. Mike and I have worked together many times before and we had an idea of how the conversation might go but were impressed by how it developed. It was clear that the group put people first and technology second. It was also interesting that the group felt organisations needed to be successful in responding to technological change rather than particular types of technology – we don’t know what the next big IT thing will be we just know its going to happen and will need to be prepared for it. The visual approach was highly successful: we got the group to think visually, to draw and to feedback on the pictures we developed. You can see the notes from the day below. These form a record of the exercises, along with some of the ideas and feedback during the day. 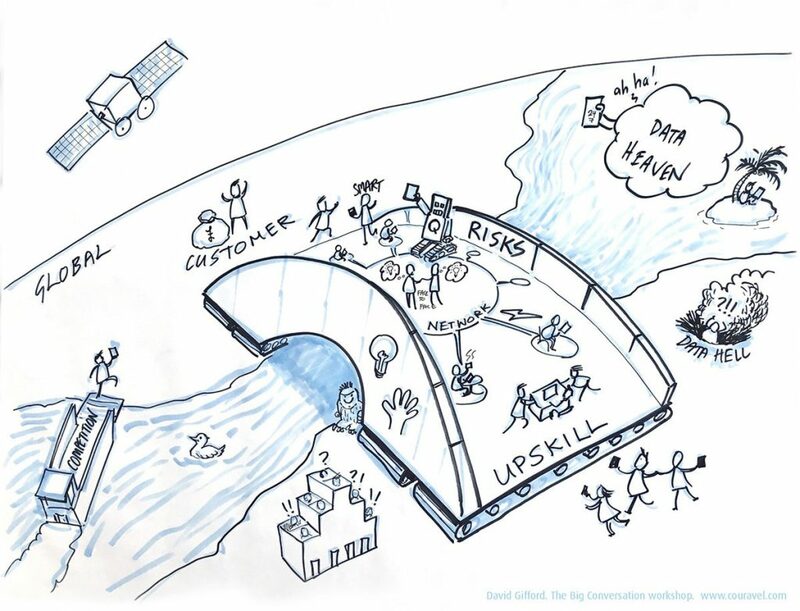 The Rich picture sketch was a summary of the themes that group had developed doing the morning sessions around people, agility, customers, skills, market disruption, risks and data.